Just coming back from a weekend in Madrid. I had no particular thoughts/plans in advance, but it's a v pleasant city. 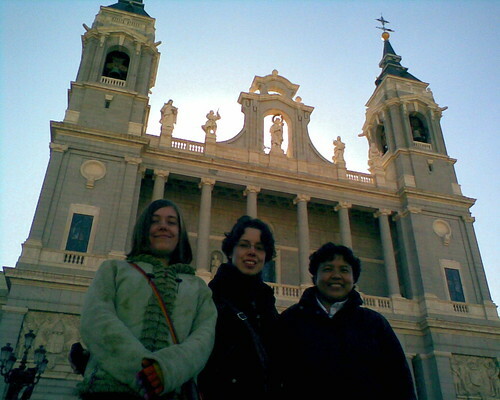 On our first full day we went wandering around with our hosts (Julia and Mari) and got a good feel for the centre of town, wandered up to the Plaza Mayor and had a beer and some spanish food... I had the spanish equivalent of black pudding which has rice in it, surprisingly enough, and some cumin too, so it tastes a bit Indian. The portions were massive and we've no idea why the Spanish don't all die of heart attacks, they were mostly eating egg and chips. One of the most striking things we saw was in the train station. Pretty unique, you walk into the train station and there's... a rain forest, with full-sized banana trees and birds flying around, and a rock-pool with dozens of turtles, all different sizes. We watched the turtles for ages, seeing them swim around, occasionally dropping into the pool or clambering out onto a rock. Dead impressive to have all this in a train station, no idea how they came up with that idea but it's brilliant. Another weird bit of wildlife we saw (the day before) was in the Retiro park. Feral cats, that seemed to have taken over one particular little bit of the park. They didn't behave like normal cats - not even like farm-cats - they wandered around a little bit more like "normal" wild or zoo animals. Weird how obviously different they were, although they were physically just like house cats. On the Monday we went to the Picasso exhibition in the Reina Sofia gallery. It was divided into four parts, representing four different chronological chunks, which was really useful to help us understand the way he developed and went through his different phases. But overall, although we found a couple of pictures we liked specifically, it turns out neither of us is much of a Picasso fan. It was good to be able to see [Guernica](http://en.wikipedia.org/wiki/Guernica_(painting%29) for real, and that's definitely a good thing to see, especially with the in-development photo sequence and the study sketches which give a real insight into the process of producing it.